​Welcome to the Karron Lab! Research in my lab focuses on evolutionary processes in flowering plant populations. My students and I are particularly interested in understanding how plant mating systems evolve and how patterns of pollinator visitation influence male and female reproductive success. Our field experiments explore how ecological factors, such as the presence of co-flowering species, and heritable traits, such as floral morphology and floral display size, influence selfing rates and patterns of paternity in monkeyflower (Mimulus ringens). 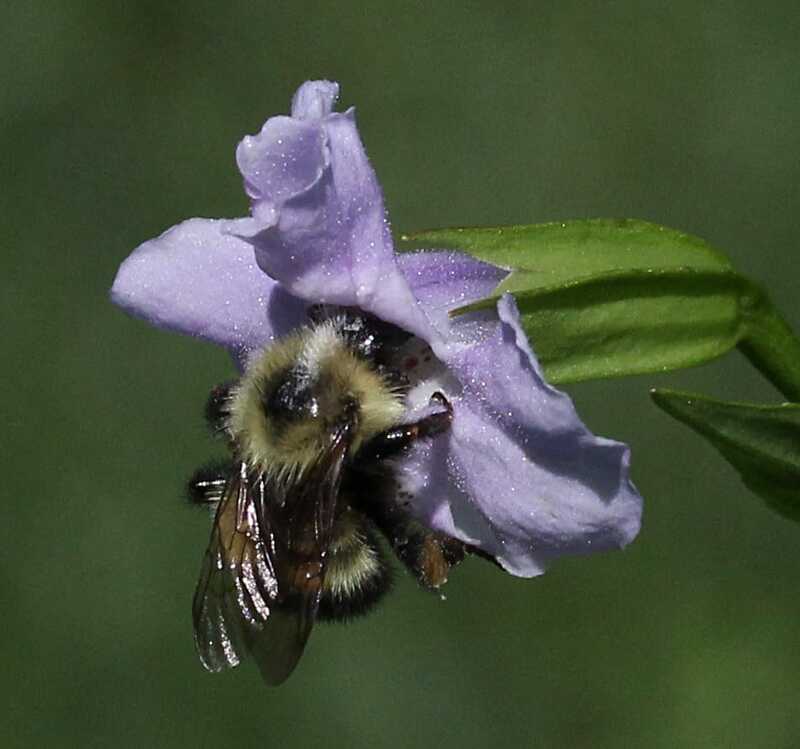 At our study sites in Wisconsin and Ohio Mimulus ringens is pollinated by several sympatric bumble bee species (especially Bombus fervidus, Bombus impatiens, and Bombus vagans). Through the use of genetic markers to unambiguously determine selfing rates and siring success of individual plants, we have developed an unparalleled data set documenting fine-scale variation in plant mating systems. Our work has shown that selfing rates increase markedly with increasing floral display size, due to the effects of geitonogamous self-pollination. Fruits are typically sired by 3-5 donors, and this high level of mate diversity results both from simultaneous deposition of mixed pollen loads as well as subsequent visits bringing in additional donors not represented in the initial visit. A description of our newly-funded research on the evolution of plant mating systems is provided below. 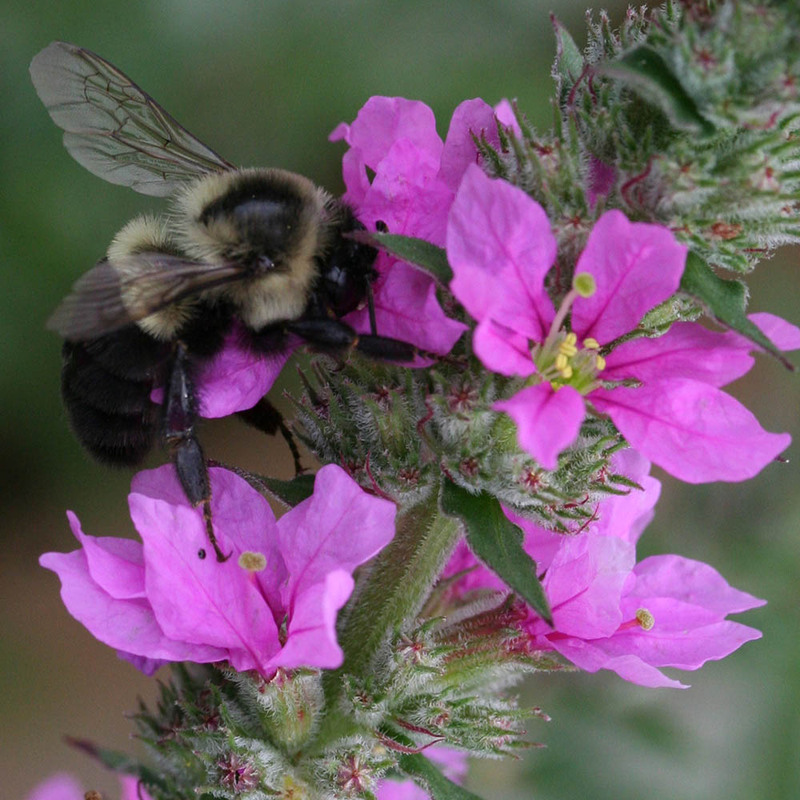 Please see our Research page for descriptions of several additional projects in our Lab, including our research on pollinator conservation, which is especially relevant in light of recent declines of several bumble bee species in North America and Europe. In particular, we are investigating whether a sudden decline of the bumble bee Bombus griseocollis would influence Asclepias verticillata reproductive success. 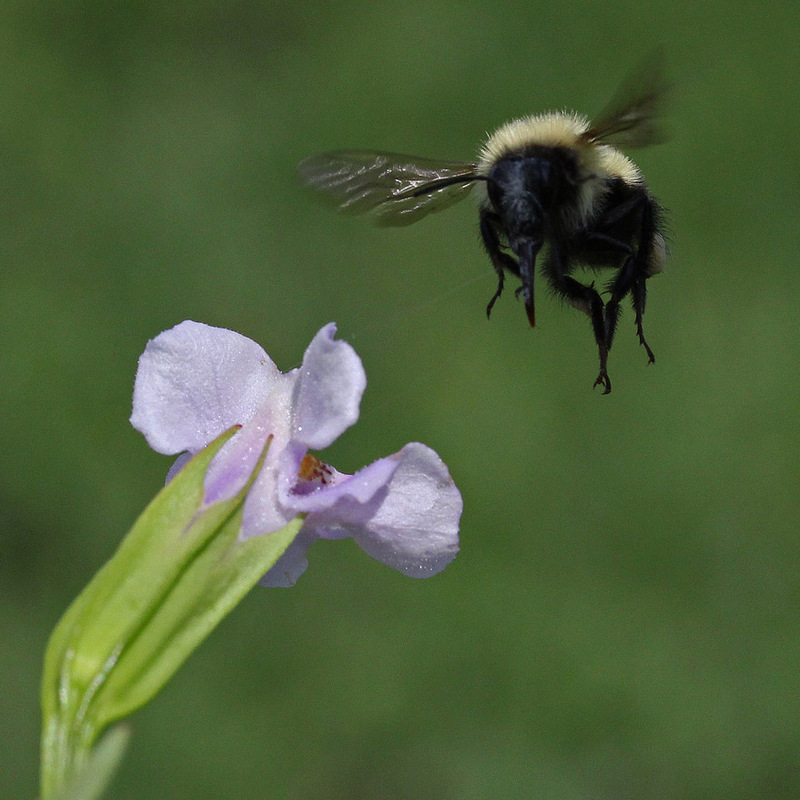 We also have studied how invasive plants, such as Lythrum salicaria (purple loosestrife), influence native plant pollination success (Flanagan et al. 2010). Negative effects of invasives on native plant reproductive success are especially likely when generalist pollinators foraging amongst native and non-native co-flowering species cause pollen loss due to grooming or to pollen misplacement on floral structures of the invasive species. We hope you will also visit our ​Pollination Gallery, which highlights the dynamics of the pollination process in both Mimulus and Asclepias. 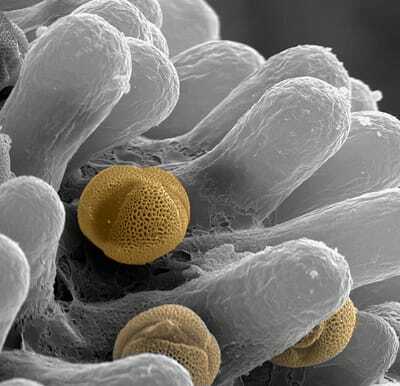 Our gallery includes SEM images showing interactions of Mimulus pollen grains as they germinate on the Mimulus stigma. A major conceptual challenge for evolutionary theory is the frequent occurrence of intermediate rates of self-fertilization in flowering plant populations. 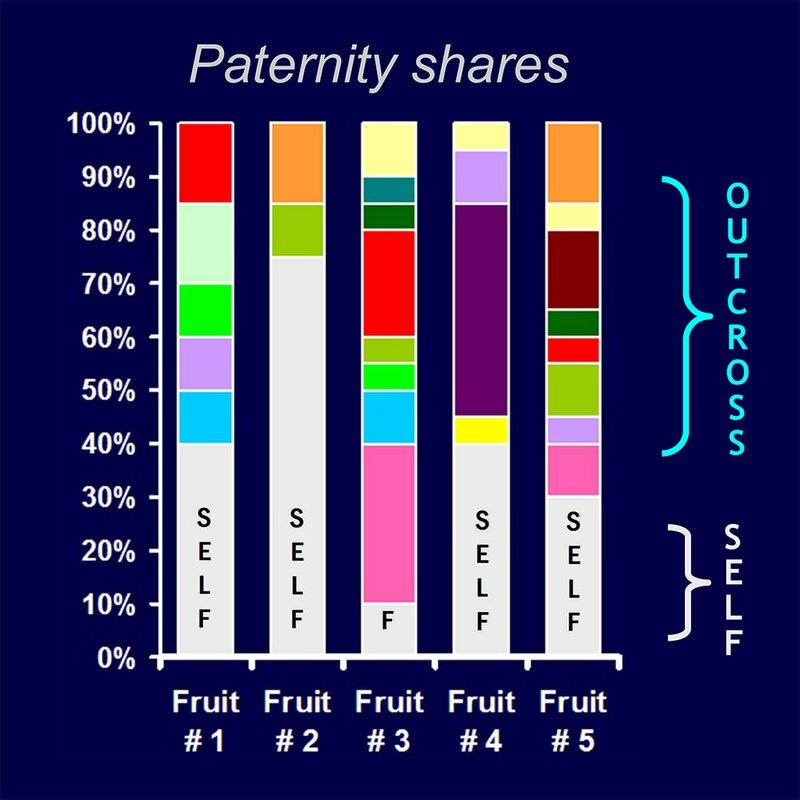 This pattern in nature is not consistent with classical genetic models, which predict that disruptive selection will cause intermediate selfing rates to be rare and transitory. Populations with low inbreeding depression should evolve predominant selfing because more maternal alleles are transmitted through self-fertilized seeds than through outcross seeds. By contrast, populations with high inbreeding depression should evolve predominant outcrossing because the transmission advantage of selfing is offset by inbreeding depression. Since populations with intermediate selfing rates are common, researchers have sought to develop and test models that explore conditions favoring stable mixed mating. Several models have highlighted the key role of tradeoffs between siring success and selfing. 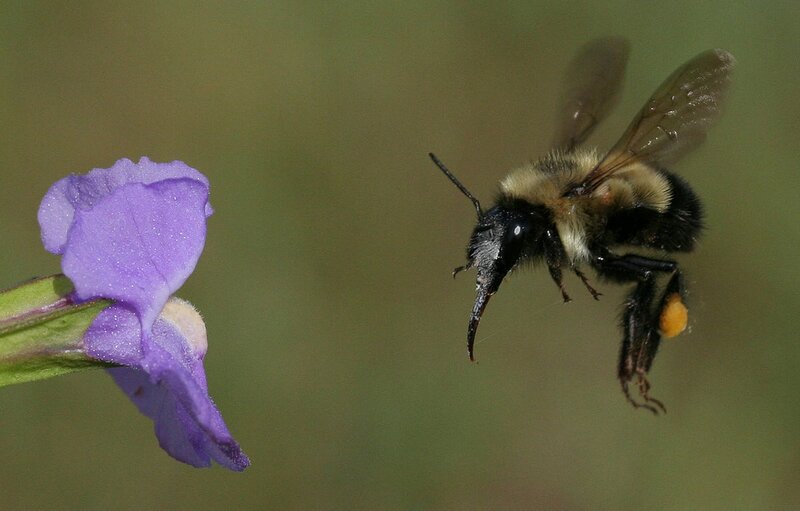 However, most models ignore a fundamental aspect of plant-pollinator interactions, which is that pollinator movements between species often waste pollen by depositing it on flowers of other species. Such pollen losses reduce outcross siring, increase selfing, and lower seed production, changing tradeoffs and altering selection. Community context can therefore be an important driver of plant mating system evolution, yet it remains largely unstudied. In collaboration with Randy Mitchell (Univ of Akron), Dorset Trapnell (Univ of Georgia), Emmanuelle Porcher (Muséum National d’Histoire Naturelle) and Celine Devaux (Université de Montpellier), this study of Mimulus ringens (monkeyflower) combines empirical and theoretical investigations to test the hypothesis that interactions with co-flowering Lobelia siphilitica alter the evolutionary tradeoff between outcross siring and selfing. We are manipulating ecological context to determine whether a change in co-flowering species abundance shifts the pattern of natural selection on selfing rate in Mimulus ringens. To explore evolutionary response to ecological context and potential synergistic effects of changes in Mimulus floral display size, we are also quantifying selfing rates, pollen limitation, and inbreeding depression in natural populations of Mimulus that differ in ecological context and floral display. Prospective Students and Postdoctoral Researchers: Please contact me if you would like more information about our lab group or the Ecology, Evolution, and Behavior Group in the UWM Department of Biological Sciences. Also, here is information about the UWM campus, the UWM Field Station and the UWM Greenhouse. 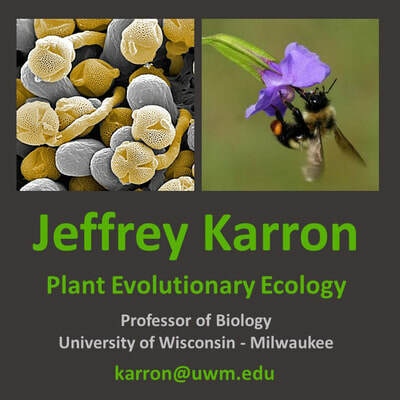 Information about Jeffrey Karron's Professional service activities: I am the North American Editor of ​Annals of Botany, which has a longstanding tradition of excellence in the fields of Plant Reproductive Biology and the Ecology and Evolution of Plant Mating Systems. I have organized three special issues for the journal: Plant-Pollinator Interactions (2009) and Plant Mating Systems (2012) and a forthcoming special issue on Ecology and Evolution of Plant Reproduction to be published in January 2019. I also edited the 2014 special issue on Pollinator-Driven Speciation, which was organized by Timotheus Van der Niet, Rod Peakall, and Steven Johnson. In 2019 Jeff Karron and lab members will be attending the Botany 2019 meeting in Tucson and the Evolution Society meeting in Providence. Krauss SL, Phillips RD, Karron JD, Johnson SD, Roberts DG, ​Hopper SD. 2017. Novel consequences of bird pollination for plant mating. TRENDS IN PLANT SCIENCE 22: 395-410. Hallett AC, Mitchell RJ, Chamberlain ER, Karron JD. 2017. Pollination success following loss of a frequent pollinator: the role of compensatory visitation by other effective pollinators. ​​All images on this web site are protected by copyright. Please contact Jeff Karron if you would like to use them for non-commercial purposes.